After researching how to deter hawks, Dan decided to try a couple of things. There are tons of recommendations on the internet: scarecrows, mirrors, fake owls, mannequins, kites, shiny fluttery milar tape, fake hawks, shutting the chickens up till the hawks go away, big dogs, larger livestock, radios, roosters, netting, and hawk call recordings. We decided to use what we had on hand, which meant a good old-fashioned straw stuffed scarecrow. We also took five old CDs and attached one, shiny side up, to the top of it's hat. I put the others in pairs, back to back, and dangled them from the scarecrows arms. It was fun to make and when we stood back for final inspection, we had a good giggle. If the chickens and goats aren't afraid of it, then I wonder what the hawks will think. Dan says we'll probably find hawks perching on it tomorrow. We have noted a change in the chickens' behavior since the hawk incident. Yesterday morning Lord B, our rooster, let out a cry and all the hens ran for cover. We didn't see anything, but are glad to know he's more watchful than before. Later, when I shook the dust out of a couple of throw rugs, the flapping sound sent the chickens running for the bushes as well. Obviously it reminded them of beating hawk's wings. 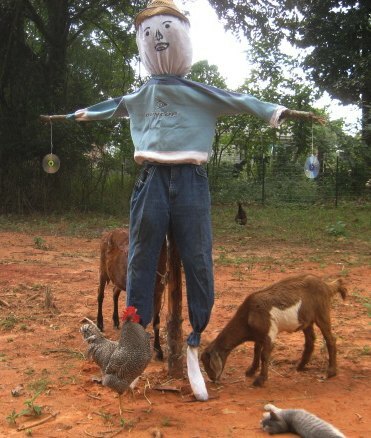 I've read mixed reviews on how well scarecrows deter hawks. Some folks report success, others don't. It seems to help if it's relocated frequently. I reckon time will tell. 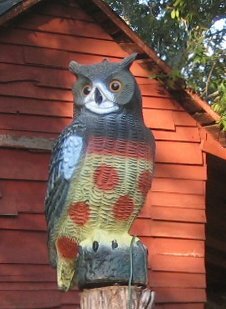 [UPDATE: 10/5/10] Yesterday while we were at Tractor Supply, we found an owl decoy for $10. These are supposed to help keep hawks away so we figured, why not. The tag said it's hand-painted for realism. Now I ask you, what in the world breed of owl sports huge orange polka dots??? I have no experience with that - but it looks very nice (maybe too nice? :)) I tried to put cd's on sticks around the veggie garden, to keep blackbirds etc. away and it seemed to work for a while, at least when there is a breeze (nearly always). they probably get used to the shiny moving things though - after a while. someone told me that they put up a criss-crossing of strings over their hen's run - but from your photos I suppose yours is too large to do this, esp. if the goats/llama are running free in there as well. I hope it works for you. He's awfully cute! Cute scarecrow. 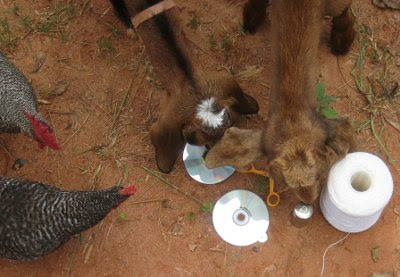 The CDs are supposed to be good to scare away birds from berry patches and large picture windows as well. I've a friend who told me that encouraging a crow family to take up residence nearby will keep away the hawks. This advice has been echoed by other chicken people as well. Apparently crows like bread treats! It's worth having a scarecrow, for the fun of it. Bettina, I wondered about them getting used to it, which is why, I suppose, it's recommended to move it about from time to time. I read about the strings or even netting over a chicken run, but since ours free range, that's impossible. The other option would be to keep the chickens in their yard, but that defeats our goals for them in the first place. Free ranging lets them feed themselves, plus they love it. There's probably a trade off here and if push comes to shove, I'm a little more worried about the kitties. Heather, I'll keep you posted! Mr. H, I'm glad to hear you've had success with a scarecrow. We have deer around too, but so far they haven't done any damage to the garden. Not sure if that will remain the case! Thank you for mentioning the crows. I remember reading about them chasing hawks, but didn't recall it when I made my hawk deterrent list. We've never much cared for crows because they used to make a mess of our neighbors garbage, plus they are known to steal baby birds. However, I'm liking them a whole lot better these days! We have a large flock about, sometimes making a huge fuss. The hawks perhaps? I will have to start leaving some bread chunks about for them. Our chickens do definitely become very wary (wery vary?) when hawks make their annual appearance in the fall. But I can sure understand your concerns for the kitties. Keep us up-to-date on the scarecrow's effectiveness, will you? 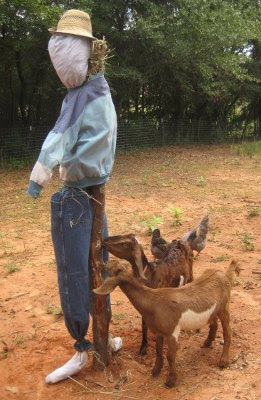 I noticed that the one goat seems to be nibbling on Dan's shorts there...I hope the goats don't eat your scarecrow's pants too as that would be sad. Perhaps a squirt down of vinegar to keep the pants from being tasty. The birds seemed to think that my garden was their very own this year. They gobbled up my apple blossoms & apples before they were even ripe...however, I noticed that a neighbor's apple tree is just fine! I wonder how they managed to keep the birds from eating them all. I've got to figure that out as I want apples for me! Love the new addition! 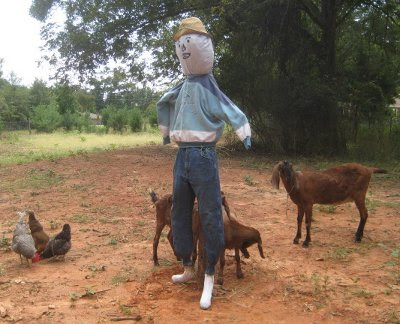 Makes me wonder if the goats will have his pants eaten off. They all look pretty interested! I hope your scare-hawk is just the man to keep the beastie away! Also, I noticed in your one pic that your cat seemed none too afraid of your scare-hawk either. I laughed out loud at that pic. The goats are adorable by the way. Mama Pea, I don't know about that! LOL I'll definitely update the effectiveness of the scarecrow. We don't have hawks full time around here, so I'm hoping the recent ones are on the migration path south. Renee, the goats were very curious and nibbled at everything. They knew it was stuffed with straw, and nibbled that. But they liked the bark on the post best. It was an old pine post and they do like pine. When you find out about deterring birds from apple trees, let us know! I will need a trick or two up my sleeve in the next couple of years. John, thank you for the visit and the comment. Much appreciated! Tami, funny but at first they were fascinated, the next day they could have cared less, LOL. Funny how quickly things become old hat. Vicki, "scarehawk," perfect! Much more appropriate because really, we want to keep the crows around to scare the hawks too. :) Good eyes for spotting Riley, on of our cats. You're right, he wasn't the least bit concerned. He just enjoyed being with the other critters! I adore goats - they are so like hounds to me. I love them nibbling on pants legs - anyones pants legs - human or dummy. Nom nom nom. Great scarecrow!!! Hope he works!! LOL.....you are so funny Leigh. My husband was making fun of me last night smiling and laughing as I was reading your blog. He told me I looked crazy sitting there smiling at the computer. Anyway, maybe there is an owl that looks like that somewhere in the world. I love the straight stripe across the top of his breast too! He's lovely and hopefully between him and the scare-hawk your hawk troubles will be over. Cheers! When you find out what deters those pesty hawks, I want to know too! We have so many hawks, coyotes, and other varmits here. I have been washing dishes at the kitchen sink, looking out the window at the barn and a big ole hawk swooped down and got a bantam hen right before my eyes! (we have one of those owls-without the spots.) it has been sitting on the fence post for a few years now.It didn't work so good here. Love the scare crow and how the critters help set him up! I sure hope it works. 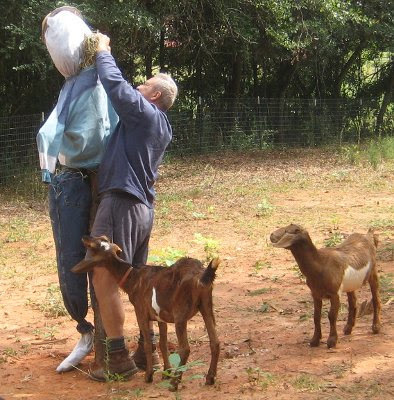 I notice the goats are intrigued with it/them. Sharon, goats certainly do love to nibble on things. In this case, they're nibbling not only on the pants, but the straw stuffing, and the bark off the pine pole! Vicki, well, it is pretty silly looking. :) Maybe the hawks will be so busy laughing hysterically that they'll forget about trying to catch chickens. Pam, I would hate that. The directions that came with the owl said to change it's location every two days. Actually, I need to put it somewhere else today! That sure is a modern breed of owl, love the color spots on it. I was all set to wax poetic about your lovely scare crow. And then I saw that owl. Oh gosh, I howled! Bety, maybe it's a new abstract breed, LOL. Maggie, isn't it the stupidest thing? I'm hoping it's the shape that counts, and not the polka dots! I love how all the animals are helping you in the process of putting up the scarecrow. Very cute and so like goats and chickens, all in your business. My problem of late has been Jack in the garden. Every time I go out to do something she is following like a dog. Today it was her trying to rub on my hands while I was planting peas and then trying to eat the pea seed packet. Grrrrr. Well it's been a year. Have you discovered anything that works? I've had hawks take my chickens right out of their run. Bold. Anonymous, they are bold, aren't they? Last year, (the year this post was written) we didn't lose a single chicken, though we had a few close calls. This year we did not put the scarecrow up and lost three chickens to hawks. I'm now thinking that the scarecrow helped more than we thought. It also helps to move the owl's location daily, something else I didn't do often enough. We think we're on a hawk migration route, so next season we'll have to be more diligent in our hawk deterrent tactics. We had a hawk come into our yard yesterday and luckily our rooster Einstein warned us. As I approached the yard screaming and yelling in hysterics to see a young chick being attacked the hawk flew away. Our chicks free range and my guess "live free or die" is a motto for a reason. We put our three dogs outside for protection the next step is a scarecrow or two. I love all living animals but believe wild animals are best to dine in the wild and we do our best to protect our domesticated animals.